Congratulations to all the winners of these awards. Their efforts exemplify hard work and dedication to Barbershop singing. The Barbershopper of the Year Award has been bestowed every year since 2006 to recognize exceptional commitment and service by members of Harbourtown Sound to the ideals of barbershop singing. 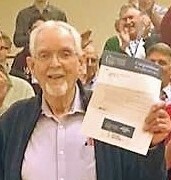 All winners of the award have demonstrated their dedication by exemplifying the mission of the chorus: to support local charities, while serving, educating, and entertaining community, business, and charitable organization members, as well as senior citizens and schoolchildren in the greater Halton-Hamilton region. The Legacy Award is conferred infrequently to members who have made an outstanding contribution to the chorus, and to the world of barbershopping. The Harbourtown Sound Legacy Award for 2018 is awarded to Bruce Bonnyman. Bruce was born and raised in Toronto, Ontario, and took to music like a duck to water. Early on, he learned to play clarinet, saxophone, and piano, and studied harmony at the Royal Conservatory of Music. At the age of 89, he has been a barbershopper for more than 70 years. His wish for everyone is that we may never grow too old to respond to the caress of a Barbershop chord. Harbourtown Sound is committed to protecting your personal data and will use any personal or sensitive data we collect from you. In Europe, this is in line with the General Data Protection Regulations (GDPR). Harbourtown Sound collects data from individuals to help us plan, organise and run the day-to-day operations of the group (e.g. co-ordinating rehearsals or collecting subscription payments) and to promote and market the group’s activities (e.g. marketing mailing lists and photography/video capture). This data will be used by our admin team to manage your membership with Harbourtown Sound and to organise and run our activities. When you sign-up to our marketing mailing list we will ask for your email address and will use this data to send you information about our events and activities (e.g. upcoming events, latest news, etc). We will only send you information that is related to Harbourtown Sound. (i.e. we will not use your data to send you marketing messages from 3rd parties). If you purchase an event ticket, or Harbourtown Sound merchandise, or make a donation, we need to collect data on the person making the purchase. This data will only be used for administering your booking/purchase/donation, and will not be used to send you marketing/promotional messages from the group. The Harbourtown Sound data retention policy is to review all data held on individuals at least every two years and remove data where we no longer have a legitimate reason to keep it.